REB rotary piston filler systems come in 9, 12 and 18 cylinder standard frame size machines and a 9 and 12 cylinder gallon frame size machines. 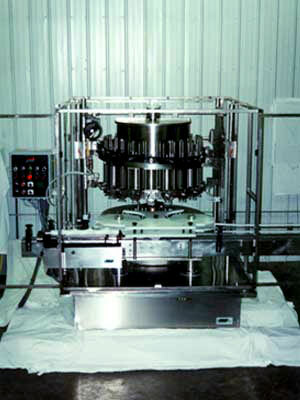 Our rotary piston filling systems are equipped with a number of excellent features. All of the wetted metal contact parts are made of 316 stainless steel. We supply our machine with two types of volume adjustment, a gross volume adjustment and an individual piston adjustment. 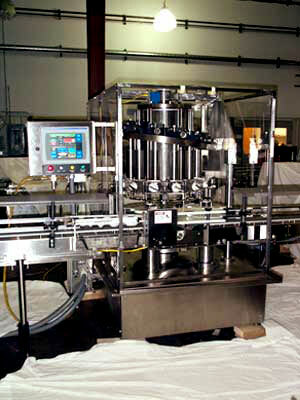 Our rotary piston fillers are controlled via a PLC. Allen Bradley is our standard. We have incorporated a touch screen as the operator interface panel. Our rotary piston filling systems run at speeds of 10 to 15 revolutions per minute with fill volumes of .5 fl oz to 139 fl oz. Our rotary piston filling systems can dispense cold or hot products and products that range in viscosities from light oils to sauces to thick creams to pie fillings into a wide range of container shapes.